December sees much of the Western world turn to merry traditions depicting typical Christmas cheer, whilst other parts of Central and Eastern Europe prepare for far darker traditions featuring a demonic counterpart to the jolly Saint Nick. 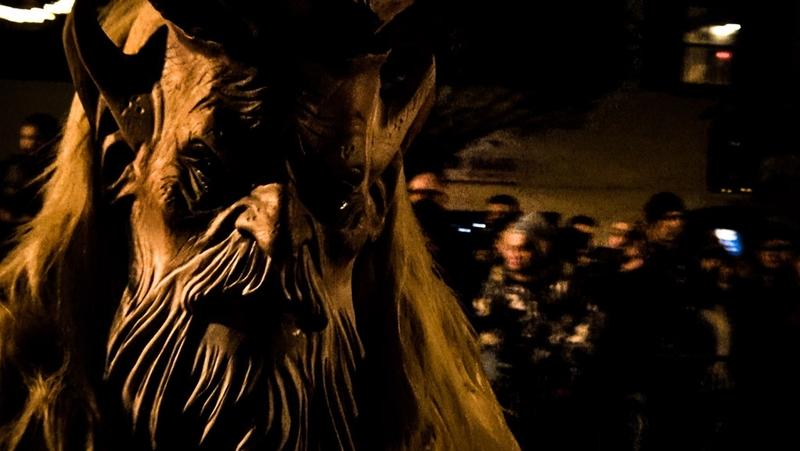 Krampus is fast becoming a frightening new tradition for people all around the world. But, who is this Christmas Devil? 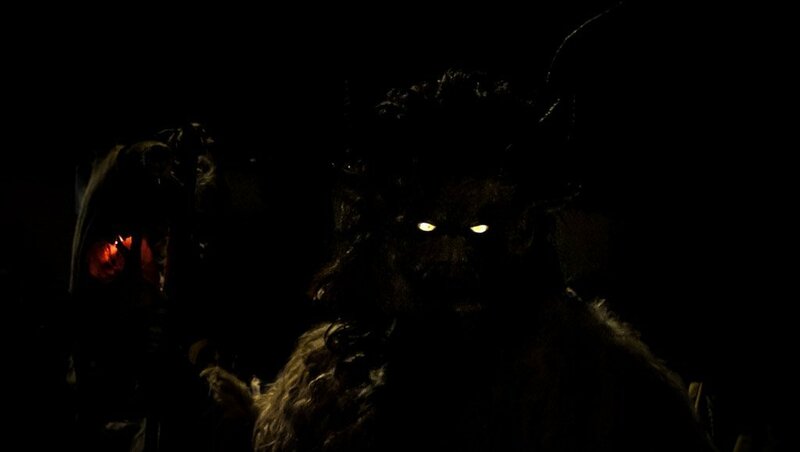 What are the origins and legends of Krampus? How can one celebrate? Close up of a typical Krampus beast. To describe Krampus is to describe the complete opposite of Saint Nicholas. A typical description of Krampus involves a part goat, part demon, beast-like creature. His existence is purely to drive good behavior from children using scare tactics. It therefore, comes as no surprise that Krampus is intimidating – covered in fur and sporting hooves, horns, fangs and claws. He typically wears chains, bells and sometimes a wicker basket or sack upon his back. Aiding in the snatching of naughty children. To accompany these accessories, he also holds whips or bundled birch sticks, helpful to dish out painful lashings. Krampus on the prowl looking for naughty children. 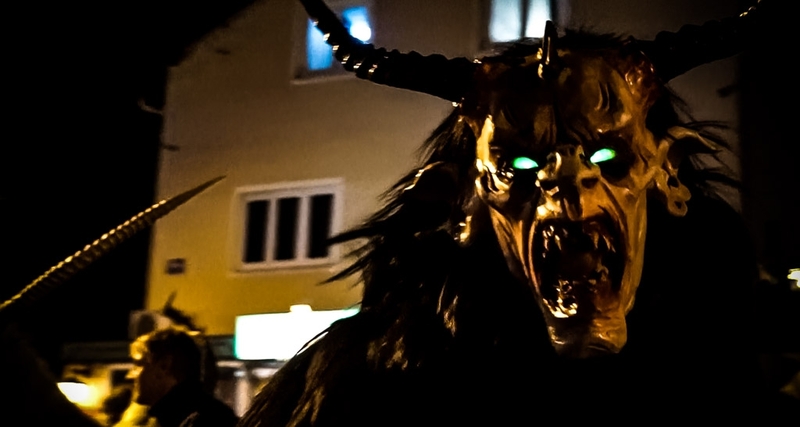 The legends of Krampus have spread throughout regions of Germany and Austria since pre-Christian times. Folklore and related legends also span throughout neighboring countries. 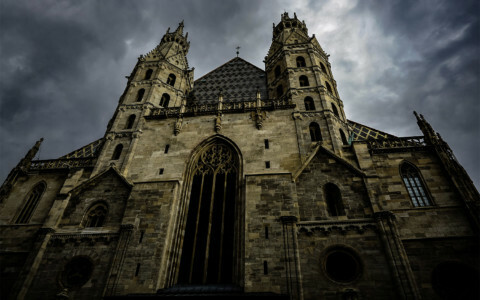 These include the Czech Republic, Hungary, Slovakia, Slovenia and some parts of Northern Italy. 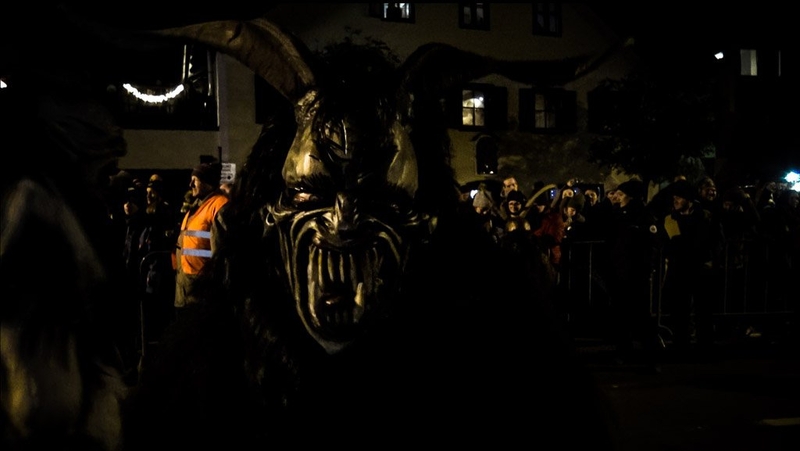 Krampus mask during a Krampuslauf in Salzburg, Austria. Each year on December 5, Krampus comes forward to make an appearance. This is known as Krampusnacht, translating to Krampus Night. During this night, Krampus reveals his determination for punishing naughty children. He will patrol the streets, family homes and even local businesses. Here he will find children, whipping them and sometimes capturing them. Naughty children are whisked away by Krampus in the basket he carries on his back only to meet a scary and undesirable fate. 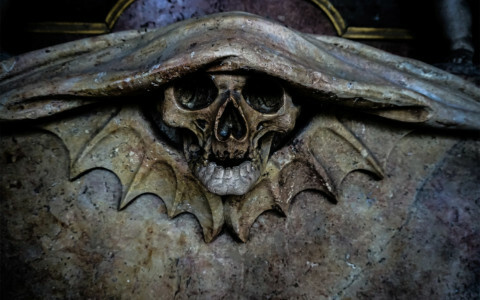 They are either drowned in a river, eaten by Krampus or dragged down to hell – a very dark contrast to the presents that good children receive from Saint Nicholas. Krampus Run in Salzburg, Austria 2018. Though Krampus is an old legend and was banned for some time during WWII, it continues to be celebrated today. Homemade masks being worn by participants in the Krampus Run. A Krampuslauf, translating to Krampus Run, is the typical means of celebration for this macabre Christmas legend. These events take place from late November through to early December. Glowing eyes of the demonic anti-Santa, Krampus. 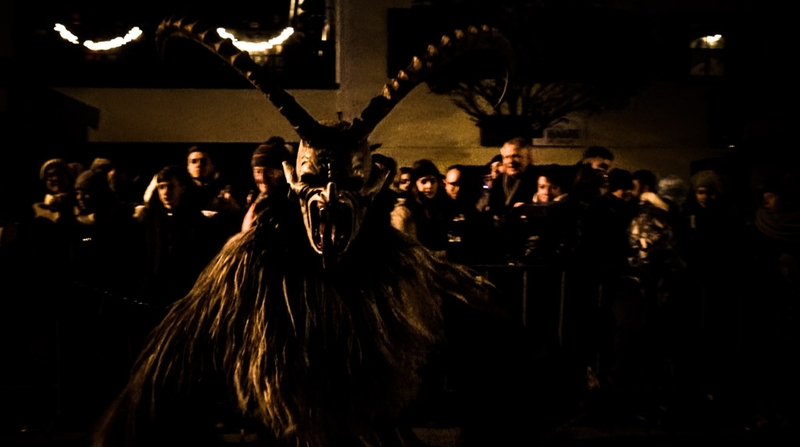 A Krampuslauf will usually consist of a number of groups who have created elaborate costumes to parade. 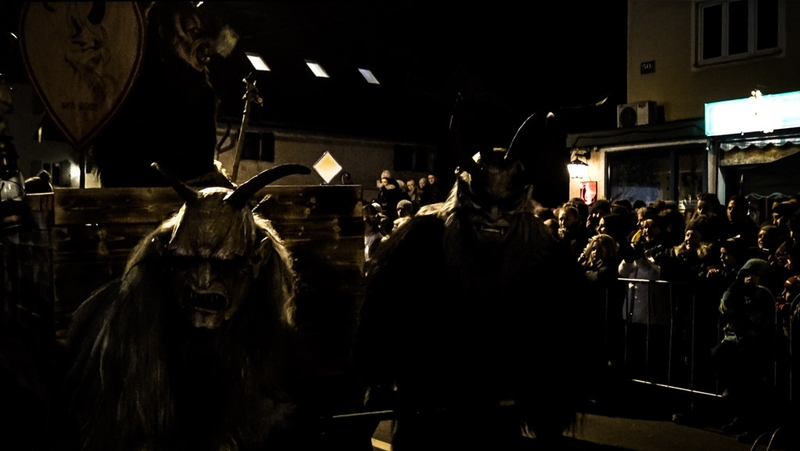 These men, women and even children will congregate within a section of designated street to show off, parade and scare children, whilst wearing their Krampus costumes. The parades usually go hand in hand with other festivities including selling of traditional food/drink and Krampus greeting cards. Intimidating Krampus during a Christmas parade. 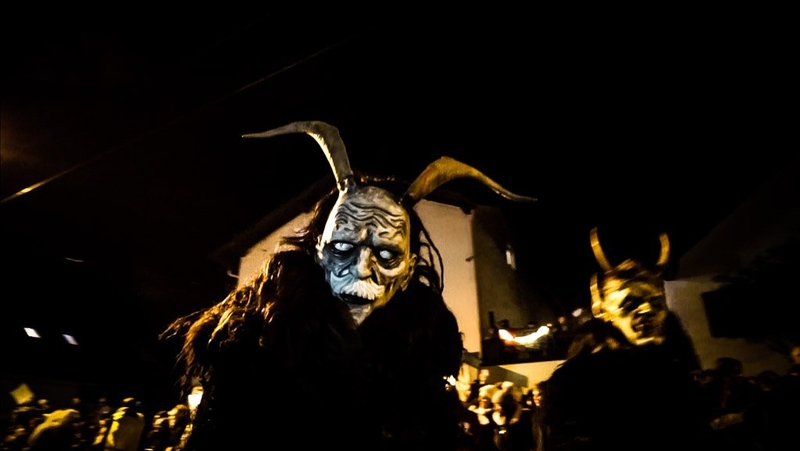 The pictures taken in this article were from one of the Salzburg Krampuslauf in 2018. I highly recommend visiting Salzburg during early December. It is a fantastic location to become engrossed with traditional Krampus festivities. 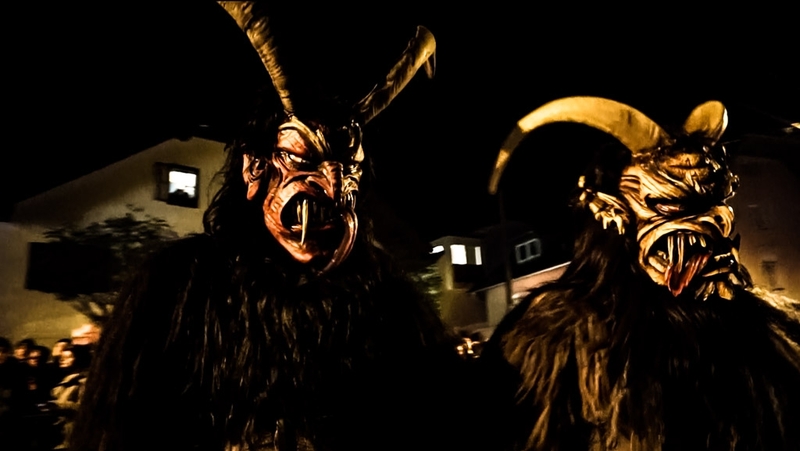 There are multiple runs which occur on Krampusnacht and its surrounding dates all throughout the region. Furthermore, the Christmas market and Christmas Museum in Salzburg city center are worth exploring. Close up of a detailed Krampus mask. Major cities connected to Salzburg via train, making transport easy. It has plenty of accommodation options. It is probably a good idea to book ahead of time if you’d like to find cheap places to stay. 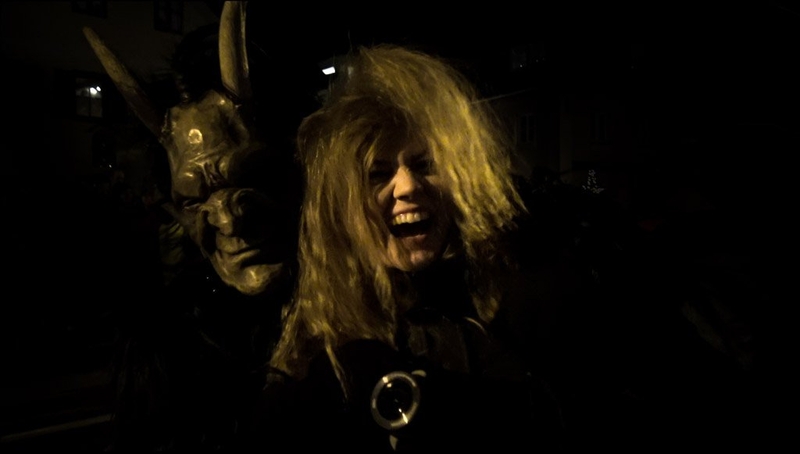 Being attacked by a Krampus in Salzburg, Austria. 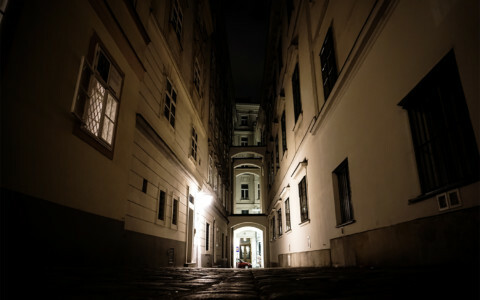 If you enjoyed this article and are looking for other unique places to visit in Austria, I recommend visiting the Nameless Cemetery in Vienna.